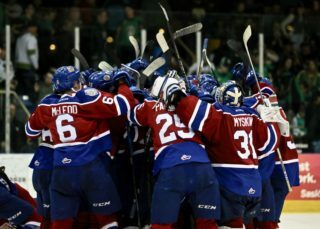 The Edmonton Oil Kings entered Saturday night’s game with a 12-0-0-1 record on the season when scoring first. They once again scored first, but by the end of the night that record became blemished for the first time in regulation. 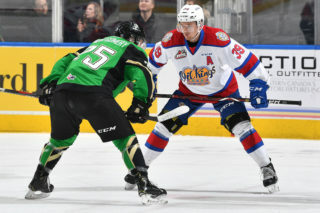 David Kope scored his first goal of the season to give the Oil Kings (13-8-1-2) a 1-0 first period lead, but it was the lone goal of the game for the home side as the Kelowna Rockets (9-13-1-0) skated to a 3-1 win in front of 8,458 fans at Rogers Place on Wizards & Witches Night. After getting in from Lethbridge in the early morning hours the night prior, it was apparent that the team didn’t come out of the gate with their most energized effort. But better a team be handed a defeat when they don’t play their best, rather than lose one when they do. Boston Bilous (3-3-0-1) got the start in goal but was handed the loss, surrendering three goals on 13 Kelowna shots. Roman Basran (7-8-1-0) picked up the win with 26 saves on 27 Edmonton shots. 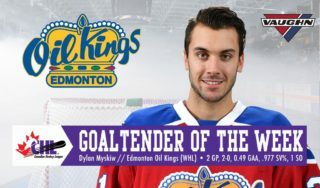 Kope opened the game’s scoring for the Oil Kings, giving his team a 1-0 edge at the 9:11 mark of the first period. 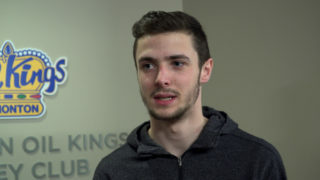 Ethan Cap and Vladimir Alistrov picked up the assists on Kope’s fourth of the season, as he beat Basran after shooting the puck through a Kelowna defender’s legs. The Rockets countered just under three minutes later with a goal of their own, making it a 1-1 game on Liam Kindree’s fourth goal of the season, from Leif Mattson and Nolan Foote on the power play at 11:53. The first period would end in a 1-1 tie, with the Oil Kings outshooting the Rockets, 6-2. Nolan Foote capitalized on an Oil Kings turnover midway through the second period to give Kelowna their first lead of the night, 2-1, at 10:06 from Mattson and Kaedan Korczak, before Foote’s second of the game and 13th of the season extended the Rockets lead to 3-1, from Kyle Topping and Mattson just 32 seconds later at 10:38. Shots on goal during the second period of play were 9-7 Edmonton, for a two-period total of 15-9, Oil Kings. 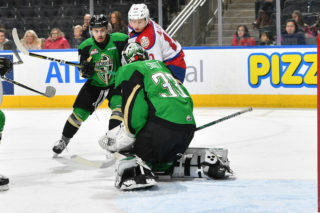 The Oil Kings played their best period in the third, but were unable to make up any ground as they saw a three-game win streak on home ice come to an end. Kelowna was 1-for-2 on the power play while Edmonton finished the night going 0-for-5 with the man advantage. Leif Mattson (KEL) (3), Roman Basran (KEL) (2), and Nolan Foote (KEL) (1) were selected as the Three Stars of the Game. Ethan Cap and Matthew Robertson each wore an “A” and skated as alternates to captain Trey Fix-Wolansky. 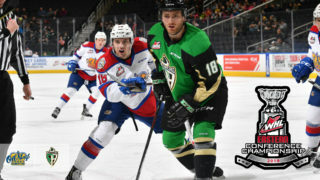 The Oil Kings are back in action on Wednesday, November 21 when they travel to Brandon to face the Wheat Kings for a 6:00 PM MT (7:00 PM CT) start. They return to Rogers Place a week later, Wednesday November 28 when they host the Prince Albert Raiders at 7:00 PM MT.